NYC School Maps is a new service providing up-to-date and comprehensive NYC elementary school zone maps, created by New York City parent, Kristi Barlow. Their school zone maps include all public elementary school zones, all unzoned elementary public schools, all elementary charter schools, and all districts--all color coded for easy reading. The available Manhattan map, 36" high, covers everything south of 126th Street. They have plans to cover upper Manhattan in the future (you can help make that happen by going to the site and requesting it on the "Future Maps" page). Digital maps are $8, printed maps $20. Both come with ongoing digital updates (so you will always have up to date information) and an information packet that includes comprehensive lists of the schools with contact info and links. The Manhattan map will be on display at our upcoming event, "How to Research and Choose a School For Your Child - A Conversation with Peg Tyre" on Tuesday, May 22nd at Kidberry. See NY Times story here. So what do you think? Will you be purchasing one of these maps? Please leave your comments below. 'Tis the Season...the school application season...and everyone is talking about schools -- at the playground, on anonymous online message boards, at the supermarket-- but are you talking to the right people and are you getting the right information? How do you know what the right school is? What do you really need to know about tours, play dates, thank you notes, lottery schools, testing, etc.? Financial aid for private schools – is it real? We have done the research for you and have put together a group of parent experts from the schools that you want to attend, who are ready to share their experiences. Let’s Talk Schools is having a social mixer, to provide parents applying to schools an opportunity to connect with other parents in an informal setting to 'talk schools’ with each other. Come mix and mingle at our School Information Speed Date Night with parents that will give you the real, unedited scoop on schools and answer your questions live, one-on- one. Our Parent Experts have knowledge of ongoing schools*, experience of successfully completing the application process and they don’t mind talking about schools all night long! We took a break for a while but now we are back. There will be postings at least once a week so please in with us for education related news and views. Our groundbreaking education blog has a new look and a new name. Preschoolpov is now Let's Talk Schools. What is our purpose? We all want our children to get a good education so they can succeed in life. But, what does a good education mean and how can we find it in our community? Where are the good schools? Why aren't all schools good schools? What is our children learning? What should they be learning and how should they learn it? These are questions we started asking ourselves, our friends, our teachers and, more importantly, our children; things we need to know before dropping our kids off at school. There are so many school to choose from - public, private, charter, parochial; progressive vs. classical teaching methods; standardized testing; how do we sort through everything? Let's Talk Schools provides an "insider's view" of our local schools using the shared opinions of parents, students and educators who have experienced the schools first hand. Guided by our ratings and feedback, parents will have the information they need to smart decisions for their child's education. Additionally, reform of our education system is a tremendous undertaking that's front and center in the national conversation and parent voices are largely missing from the debate. We aim to be that voice in the national conversation. We need to educate ourselves about the issues and get involved. Let's work with the schools in our local community to figure out what they need to provide a decent education for ALL children, not just our own. 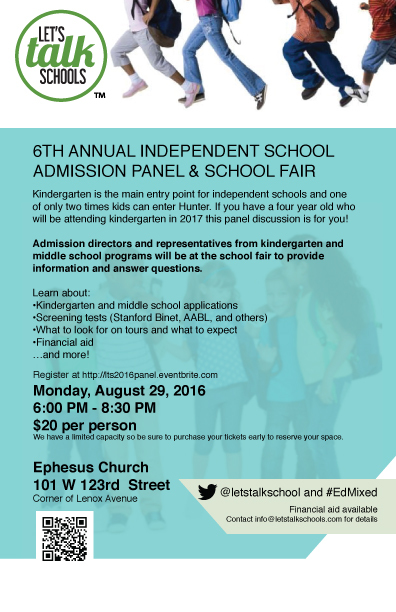 So join us and Let's Talk Schools!